Background sST2 is a new biomarker that was predominantly studied in adults with heart failure but was not adequately investigated in other diseases or in children. Aim to evaluate the diagnostic and prognostic values of sST2 in critically ill children. Patients and methods A prospective observational study of 70 children admitted into Pediatric intensive care unit (PICU) and 20 healthy controls. sST2 was measured within 24 hours of admission. Pediatric Risk of Mortality (PRISM) and Pediatric Index of Mortality 2 (PIM2) were calculated. Primary outcome was 30-day mortality. Results sST2 was significantly higher among critically ill children compared with controls (P<0.001). sST2 was significantly elevated among septic children compared with controls (P<0.001) and the area under receiver operating characteristic curve (AUC) for discriminating septic children from controls was excellent (AUC=0.958, P<0.001). However, no significant difference in sST2 level was noted between septic and non-septic children or between survivors and non-survivors. sST2 was not correlated with CRP, PRISM, PIM2, or other indicators of disease severity. Conclusion sST2 is an acute phase protein with potential value in sepsis diagnosis. However, sST2 is not useful for predicting disease severity and prognosis of critically ill children. Suppression of tumorigenicity 2 (ST2) is a member of interleukin (IL)-1 receptor family expressed mainly on T helper 2 and mast cells. IL-33 is the ligand for ST2 whose binding ultimately leads to production of the cytokines associated with T helper 2 response ,. The IL-33/ST2 pathway is involved in the immune response against parasitic  and viral infections . It was also suggested to attenuate atherosclerosis and to possess a protective effect in heart failure . However, IL-33/ST2 pathway promotes the pathogenesis of some clinical conditions like asthma, atopic dermatitis, and rheumatoid arthritis . ST2 exists in two main forms: the first is a membrane-bound full-length form (ST2L) which mediates IL-33 actions, whereas the second is a soluble form (sST2) which is almost identical to the extracellular domain of the membrane-bound form and can be readily measured in peripheral blood . Proinflammatory stimuli induce the expression of sST2, which, in turn, represses macrophages’ production of proinflammatory cytokines . Furthermore, sST2 acts as a decoy receptor that competes with ST2L for IL-33 binding, thus controlling the effects of the latter . Being a negative regulator of inflammation, sST2 was postulated to contribute to development of the state of immunosuppression in sepsis and may be related to occurrence of nosocomial infections . sST2 level increases in heart failure and has been recently added to heart failure management guidelines as a prognostic marker . sST2 level has also been shown to rise in several clinical disorders, including autoimmune diseases , asthma exacerbations , pulmonary fibrosis , and sepsis . Previous clinical studies of sST2 have been conducted predominantly in specific clinical conditions in adults. The objective of the present study was to evaluate the diagnostic and prognostic values of sST2 in an unselected cohort of critically ill children, which, to the best of our knowledge, was not addressed by previous pediatric studies. This was a prospective observational study conducted on 70 critically ill children who were consecutively recruited from a 10-bed PICU in Menoufia University Hospital, Menoufia, Egypt, from January to August 2017. A written informed consent was taken from the parents, and the protocol of the study was approved by the Menoufia Faculty of Medicine Committee for Medical Research Ethics. The exclusion criteria included age less than 1 month or more than 18 years and failure to take a blood sample within 24 h of PICU admission. Besides the patient group, another group of 20 healthy children was included as a control group. The diagnostic workup performed for each patient included routine investigations and measurement of conventional biomarkers like C-reactive protein (CRP), white blood cells (WBC), and platelet counts. Search for infectious agents was performed through culture of body fluids, including blood, urine, cerebrospinal fluid, and respiratory secretions. Other laboratory and radiological investigations were requested when clinically warranted. Sepsis was diagnosed if a patient had systemic inflammatory response syndrome in the presence of suspected or proven infection as recommended by the international pediatric sepsis consensus conference . According to these guidelines, severe sepsis was diagnosed in the presence of acute respiratory distress syndrome, cardiovascular organ dysfunction, or two other organ dysfunctions. Pediatric risk of mortality (PRISM)  and pediatric index of mortality 2 (PIM2)  were also calculated for each patient. A single sST2 measurement was performed for patients within 24 h of PICU admission as well as for the control group. The course of illness was closely monitored, and the primary outcome was 30-day mortality. From every patient, a 2 ml venous blood sample was withdrawn within 24 h of PICU admission. The blood was allowed to clot and then centrifuged at 4000 rpm for 10 min. The separated serum was stored at −80°C till analysis. Quantification of serum sST2 was based on standard sandwich enzyme-linked immunosorbent assay (ELISA). The assay procedure was done according to the protocol of Human Interleukin 1 receptor like protein 1, IL-1RL1/St2 ELISA Kit (catalog no. : BYEK2402; Biospes, Chongqing, China). Quantitative variables with non-normal distribution were presented as median and range. Qualitative data were analyzed by χ2-test. Fisher’s exact test was used for 2×2 qualitative variables when more than 25% of the cells had expected count less than 5. Non-normally distributed continuous variables were compared by Mann–Whitney U-test (for two variables) and Kruskal–Wallis test (for more than two variables). Receiver operating characteristic curve analysis was used to test the performance of sST2 and other biomarkers in discriminating patients with sepsis from other critically ill patients and also to discriminate survivors from nonsurvivors. Correlations between variables with skewed distribution were performed by Spearman’s correlation. A P value of less than 0.05 was considered statistically significant. Statistical analyses were performed using IBM statistical package for social sciences (version 20; SPSS Inc., Chicago, Illinois, USA). The baseline demographic and clinical characteristics of patients and controls are shown in [Table 1]. The most common reason for PICU admission was infectious diseases (40%), mostly pneumonia (25.7% of all patients). Overall, 30% of patients had sepsis, 32.9% needed invasive mechanical ventilation, and 25.7% died. sST2 was significantly higher among the whole cohort of critically ill children compared with controls (P<0.001). In addition, sST2 was significantly elevated among septic children compared with controls (P<0.001) and also significantly elevated among nonseptic children compared with controls (P<0.001) ([Figure 1]). 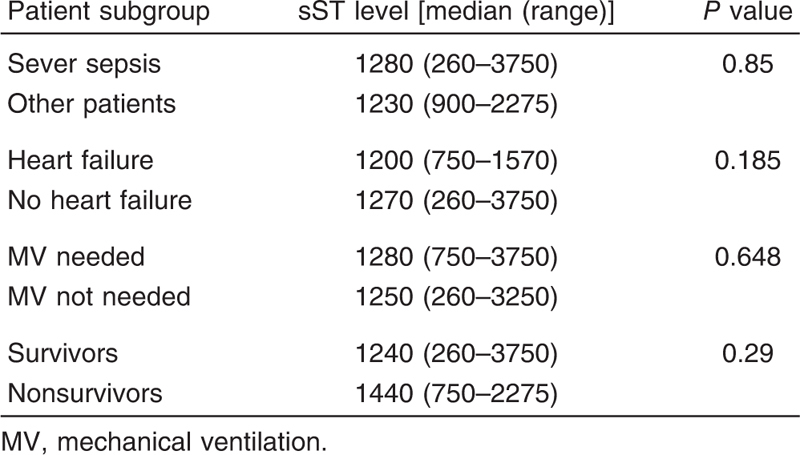 Figure 1 sST2 level in pg/ml in patients and controls: The median (and range) of sST2 among the whole patient cohort was 1250 (260–3750). For the control group, it was 272.5 (250–300). For children with sepsis, it was 1280 (260–3750). For critically ill children without sepsis, it was 1200 (700–2850). sST2 had an area under the curve (AUC) of 0.958 (P<0.001) for differentiating children with sepsis from controls ([Figure 2]), with a cut-off level of 300 pg/ml, having a sensitivity of 90.5% and a specificity of 100%. 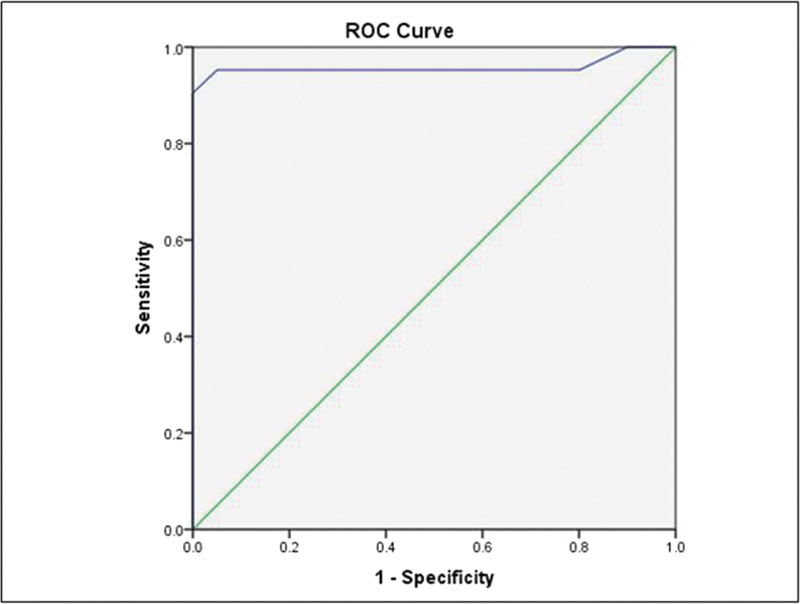 Figure 2 Receiver operating characteristic curve analysis for differentiating between children with sepsis and controls. However, no significant difference in sST2 level was noted between septic and nonseptic critically ill children, and the AUC for discriminating septic children from other critically ill children by sST2 was 0.608 (P=0.16) compared with an AUC of 0.613 and 0.670 for CRP and WBC, respectively. Importantly, no significant difference in sST2 level was detected between patients with heart failure and other patients ([Table 2]). No significant correlation was found between sST2 and other conventional sepsis biomarkers, including CRP and WBC ([Table 3]). Among critically ill children, no significant difference in sST2 level was found between survivors and nonsurvivors. 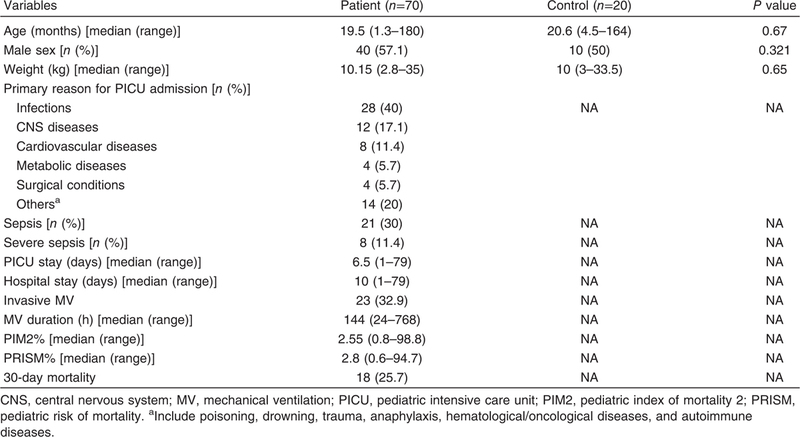 Furthermore, no significant difference was found between patients with severe sepsis and the other patients or between those who needed invasive mechanical ventilation and those who did not need it ([Table 2]). Like both CRP and WBC, sST2 had a modest AUC of 0.584 for prediction of mortality (P=0.291) ([Table 4]), whereas PRISM and PIM2 had a good AUC of 0.809 and 0.802, respectively. No significant correlation was found between sST2 and indicators of disease severity like PRISM, PIM2, length of PICU stay, and mechanical ventilation duration ([Table 3]). The ideal biomarker in pediatric emergency medicine is still missing; therefore, the list of biomarkers evaluated by researchers continues to grow. In the present study, we were able to demonstrate that the admission sST2 level was significantly elevated among critically ill children compared with healthy controls, suggesting that sST2 could be used as an acute phase protein. This is consistent with a study of critically ill adults without a primary cardiac disease where 96% of patients had elevated sST2 above the reference limit, but the authors suggested that sST2 rise was because of unrecognized cardiac injury . However, we think, in light of experimental and clinical data ,, that the inflammatory state is an equally tenable explanation. 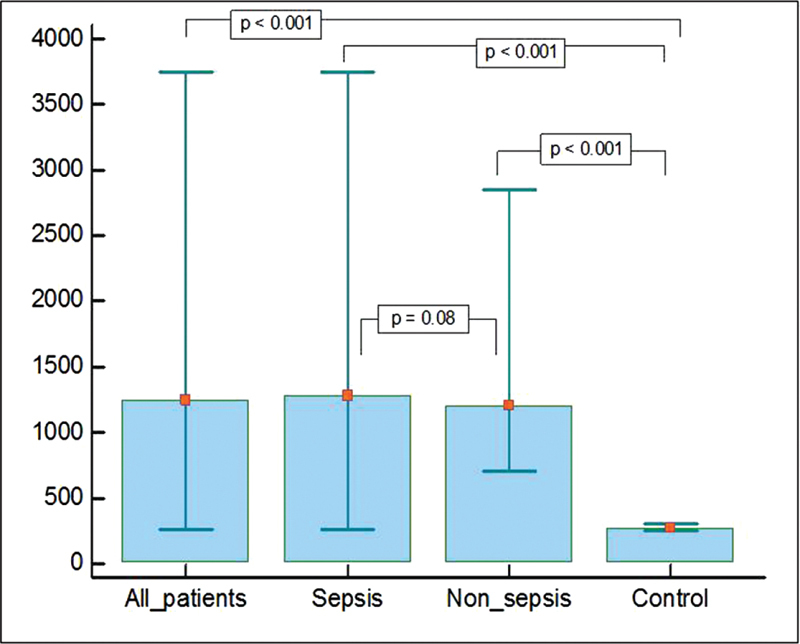 In the present study, sST2 level was also significantly higher in patients with sepsis compared with controls, and the AUC for differentiating septic children from controls was excellent (0.958), suggesting that sST2 could be used as a sepsis biomarker. A similar finding was reported by another pediatric study which detected, in addition, a significant difference between sST2 value measured in the first day of admission and a repeat measurement after 48–72 h . Likewise, a significantly elevated sST2 was detected among adults with severe sepsis compared with controls . sST2 elevation was not confined to children with sepsis in the present study. Consistent with our finding, sST2 was previously shown to be significantly elevated not only in adults with sepsis but also in those with pneumonia , trauma, and surgery . However, in contrast to some studies in adults ,,, we did not find a significant difference in sST2 level between septic children and other critically ill children . The failure of sST2, in the present study, to differentiate between children with sepsis and other critically ill children may be owing to the small sample size or a difference in sST2 regulation in children compared with adults. In addition, we measured sST2 once within 24 h of admission, and it is quite possible that the diagnostic value of sST2 is not consistent over time as demonstrated by Parenica et al. who showed that the value of admission sST2 measurement in distinguishing septic shock from cardiogenic shock was lost after 12–24 h.
In spite this lack of specificity, it should be borne in mind that many other sepsis biomarkers also arise in conditions other than sepsis. Besides, it could be expected that a new elevation of sST2 from a baseline level in a patient being treated for a noninfectious critical illness (like surgery or trauma) might indicate occurrence of sepsis. In addition to the diagnostic value, sST2 was studied for a potential prognostic value particularly in adult heart failure where it proved most useful . In the current research, no difference in this sST2 level was observed between survivors and nonsurvivors, and the AUC for prediction of mortality by sST2 was poor compared with PRISM and PIM2. These findings conflict with previous studies of unselected groups of critically ill adults ,,. The prognostic value of sST2 was more commonly studied in specific populations of critically ill patients with conflicting results. Some reported an association of sST2 with mortality in adults with sepsis , and in children with idiopathic and heritable pulmonary arterial hypertension  whereas other studies failed to predict mortality by sST2 in adult patients with trauma  and in adults with septic shock or cardiogenic shock .The prognostic value of sST2 demonstrated in some adult studies may have been masked in the present study by the small patient number or by a difference between children and adults. Alternatively, the prognostic value of sST2 may be less clear at admission compared with later measurements as demonstrated by some researchers . In the present study, we did not find a significant correlation between sST2 and CRP which is consistent with some studies that found no or very modest correlation between the two markers ,. This could be explained by a difference in the mechanisms regulating their production and clearance. Unlike some researchers  who found an association between sST2 and duration of ICU and hospital stay, we failed to find an association with any indicators of disease severity, including PRISM, PIM2, and the need for mechanical ventilation. Anyhow, if a prognostic value of sST2 is established in future studies, the underlying mechanism will, most probably, involve induction of a state of immunosuppression by sST2 in critical illness. It is also possible that sST2 elevation may be just an epiphenomenon. The current study addresses a new topic in pediatric research. However, it has some limitations, including a small sample size and a lack of repeat sST2 measurement. In addition, sepsis diagnosis was not always based on isolation of an organism. Moreover, the patients were not homogenous regarding the reason for PICU admission, but some researchers favor this approach as the real world is similarly heterogeneous. sST2 is an acute phase protein that is potentially useful for diagnosis of sepsis, although it cannot differentiate sepsis from other critical illnesses. 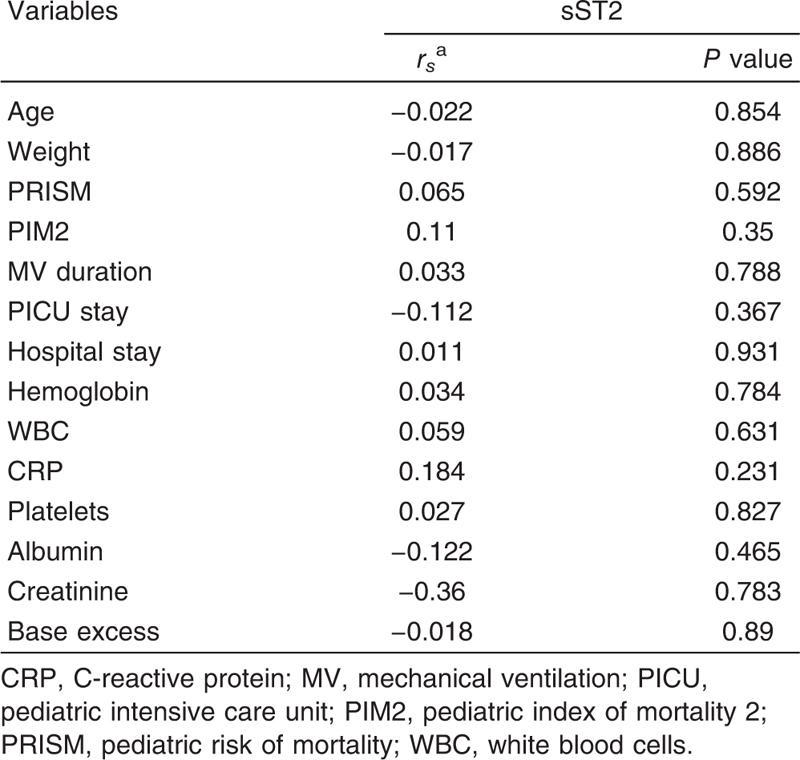 In contrast, sST2 is not useful for predicting mortality or disease severity in critically ill children. Larger studies are needed to more fully elucidate the real role of this biomarker in pediatric emergency medicine. Xu D, Chan WL, Leung BP, Huang FP, Wheeler R, Piedrafita D et al. Selective expression of a stable cell surface molecule on type 2 but not type 1 helper T cells. J Exp Med 1998; 187:787–794. Schmitz J, Owyang A, Oldham E, Song Y, Murphy E, McClanahan TK et al. IL-33, an interleukin-1-like cytokine that signals via the IL-1 receptor related protein ST2 and induces T helper type 2-associated cytokines. Immunity 2005; 23:479–490. Humphreys NE, Xu D, Hepworth MR, Liew FY, Grencis RK. IL-33, a potent inducer of adaptive immunity to intestinal nematodes. J Immunol 2008; 180:2443–2449. Walzl G, Matthews S, Kendall S, Gutierrez-Ramos JC, Coyle AJ, Openshaw PJ, Hussell T. Inhibition of T1/St2 during respiratory syncytial virus infection prevents T helper cell type 2 (Th2) but not Th1-driven immunopathology. J Exp Med 2001; 193:785–792. Kunes P, Mandak J, Holubcova Z, Kolackova M, Krejsek J. Actual position of interleukin (IL)-33 in atherosclerosis and heart failure: great expectations or enattendant godot? Perfusion 2015; 30:356–374. Liew FY, Pitman NI, McInnes IB. Disease-associated functions of IL-33: the new kid in the IL-1 family. Nat Rev Immunol 2010; 10:103–110. De la Fuente F M , MacDonald TT, Hermoso MA. The IL-33/ST2 axis: role in health and disease. Cytokine Growth Factor Rev 2015; 26:615–623. Sweet MJ, Leung BP, Kang D, Sogaard M, Schulz K, Trajkovic V et al. A novel pathway regulating lipopolysaccharide-induced shock by ST2/T1 via inhibition of Toll-like receptor 4 expression. J Immunol 2001; 166:6633–6639. Kakkar R, Lee RT. The IL-33/ST2 pathway: therapeutic target and novel biomarker. Nat Rev Drug Discov 2008; 7:827–840. Hoogerwerf JJ, Leendertse M, Wieland CW, de Vos AF, de Boer JD, Florquin S, van der Poll T. Loss of suppression of tumorigenicity 2 (ST2) gene reverses sepsis-induced inhibition of lung host defense in mice. Am J Respir Crit Care Med 2011; 183:932–940. Yancy CW, Jessup M, Bozkurt B, Butler J, Casey J, Drazner MH et al. 2013 ACCF/AHA guideline for the management of heart failure: a report of the American college of cardiology foundation/American heart association task force on practice guidelines. J Am Coll Cardiol 2013; 62:e147–e239. Kuroiwa K, Arai T, Okazaki H, Minota S, Tominaga S. Identification of human ST2 protein in the sera of patients with autoimmune diseases. Biochem Biophys Res Commun 2001; 284:1104–1108. Oshikawa K, Kuroiwa K, Tago K, Iwahana H, Yanagisawa K, Ohno S et al. Elevated soluble ST2 protein levels in sera of patients with asthma with an acute exacerbation. Am J Respir Crit Care Med 2001; 164:277–281. Tajima S, Oshikawa K, Tominaga S, Sugiyama Y. The increase in serum soluble ST2 protein upon acute exacerbation of idiopathic pulmonaryfibrosis. Chest 2003; 124:1206–1214. Brunner M, Krenn C, Roth G, Moser B, Dworschak M, Jensen-Jarolim E et al. Increased levels of soluble ST2 protein and IgG1 production in patients with sepsis and trauma. Intensive Care Med 2004; 30:1468–1473. Goldstein B, Giroir B, Randolph A. International pediatric sepsis consensus conference: definitions for sepsis and organ dysfunction in pediatrics. Pediatr Crit Care Med 2005; 6:2–8. Pollack MM, Ruttimann UE, Getson PR. Pediatric risk of mortality (PRISM) score. Crit Care Med 1988; 16:1110–1116. Slater A, Shann F, Pearson G; Paediatric Index of Mortality (PIM) Study Group. PI M2: a revised version of the Paediatric Index of Mortality. Intensive Care Med 2003; 29:278–285. Rudolf JW, Lewandrowski EL, Lewandrowski KB, Januzzi JL, Bajwa EK, Baron JM. ST2 predicts mortality and length of stay in a critically ill noncardiac intensive care unit population. Am J Clin Pathol 2016; 145:203–210. López-Casado MA, Lorite P, Palomeque T, Torres MI. Potential role of the IL-33/ST2 axis in celiac disease. Cell Mol Immunol 2017; 14:285–292. Bruneau S, Le Berre L, Hervé C, Valanciuté A, Kamal M, Naulet J et al. Potential role of soluble ST2 protein in idiopathic nephrotic syndrome recurrence following kidney transplantation. Am J Kidney Dis 2009; 54:522–532. Çekmez F, Fidanci MK, Ayar G, Saldir M, Karaoglu A, Gündüz RC et al. Diagnostic value of Upar, IL-33, and ST2 levels in childhood sepsis. Clin Lab 2016; 62:751–755. Hoogerwerf JJ, Tanck MW, van Zoelen MA, Wittebole X, Laterre PF, van der Poll T. Soluble ST2 plasma concentrations predict mortality in severe sepsis. Intensive Care Med 2010; 36:630–637. Mueller T, Leitner I, Egger M, Haltmayer M, Dieplinger B. Association of the biomarkers soluble ST2, galectin-3 and growth-differentiation factor-15 with heart failure and other non-cardiac diseases. Clin Chim Acta 2015; 445:155–160. Hur M, Kim H, Kim HJ, Yang HS, Magrini L, Marino R et al. Soluble ST2 has a prognostic role in patients with suspected sepsis. Ann Lab Med 2015; 35:570–577. Parenica J, Malaska J, Jarkovsky J, Lipkova J, Dastych M, Helanova K et al. Soluble ST2 levels in patients with cardiogenic and septic shock are not predictors of mortality. Exp Clin Cardiol 2012; 17:205–209. Dieplinger B, Egger M, Koehler W, Firlinger F, Poelz W, Lenz K et al. Prognostic value of soluble ST2 in an unselected cohort of patients admitted to an intensive care unit − The Linz Intensive Care Unit (LICU) study. Clin Chim Acta 2012; 413:587–593. Dieplinger B, Egger M, Leitner I, Firlinger F, Poelz W, Lenz K et al. Interleukin 6, galectin 3, growth differentiation factor 15, and soluble ST2 for mortality prediction in critically ill patients. J Crit Care 2016; 34:38–45. Chida A, Sato H, Shintani M, Nakayama T, Kawamura Y, Furutani Y et al. Soluble ST2 and N-terminal pro-brain natriuretic peptide combination. Useful biomarker for predicting outcome of childhood pulmonary arterial hypertension. Circ J 2014; 78:436–442. Shimpo M, Morrow DA, Weinberg EO, Sabatine MS, Murphy SA, Antman EM, Lee RT. Serum levels of the interleukin-1 receptor family member ST2 predict mortality and clinical outcome in acute myocardial infarction. Circulation 2004; 109:2186–2190.